If E.T. is out there, it may be a lot easier to find him than we thought  mostly because there are a lot more places for him to live. Scientists looking for life (or at least earthlike life) have always obeyed a simple rule: follow the water. Biology is a wet process, after all  and generally the wetter the better. Now, the Herschel Space Observatory has spotted an infant solar system 175 million light years from Earth that seems fairly awash in primordial water. The finding suggests many more such systems may be out there  and offers tantalizing clues about how our own biologically rich world began as well. Herschel, which was launched by the European Space Agency in 2009, hovers in space 930,000 miles (1.5 million km) from Earth at what's known as a Lagrange point, a gravitationally quirky spot where the pull of the planet Earth and the sun balance out. This allows a spacecraft placed just so to remain locked in place on the far side of the planet, shielded from solar interference. In the case of Herschel, that's important, because the readings it takes are exquisitely precise, scanning the skies in the far infrared and submillimeter wavelengths. 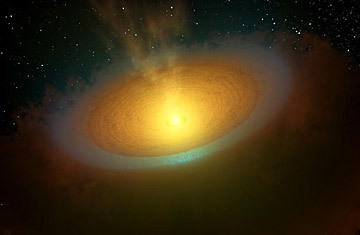 Turning its gaze toward a star known as TW Hydrae  a comparatively cool orange dwarf just 10 million years old  the telescope recently found a vast disk of dusty material moving in a solar orbit about 200 times as far from the star as Earth is from our own sun. Dust is just dust in the visible spectrum, but operating in the extreme infrared, Herschel was able to spot the surprising signal of water  lots and lots of water  created as ultraviolet light from the star knocked individual water molecules free from the traces of ice that cling to the dust grains. "These are the most sensitive [infrared] observations to date," said NASA project scientist Paul Goldsmith, who collaborates with the European investigators in analyzing Herschel findings. "It is a testament to the instrument builders that such weak signals can be detected." What struck Goldsmith and the others was not just the vast quantity of water ice surrounding TW Hydrae, but also its location. Water halos have been found in the warm inner reaches of young solar systems before, but the proximity of the solar fires usually blasts the vapor farther into space where it gets locked up as ice in outer planets and moons. That's what happened in our own solar system, and helps explain why Mercury, Venus and Mars are so dry and the distant gas giants are so icy. What that model doesn't explain, of course, is how Earth got so wet. One of the prevailing theories has long been that incoming comets crashed into our planet, carrying water ice with them. That scenario became even more plausible as a result of two studies earlier this month  one that found that comets in our solar system carry the same chemical signature as the water in Earth's oceans; and another that discovered what amounts to a hailstorm of comets striking a planet circling the Eta Corvi, a bright star visible in our northern hemisphere. What's happening out there could have easily happened here. The new findings push the knowledge frontier further since the colder region where the TW Hydrae vapor disk was found is exactly where comets could more easily form, but where the raw materials for that to happen had not been seen until now. Says Herschel astronomer Michiel Hogerheijde of the Leiden Observatory in the Netherlands: "Our observations of this cold vapor indicate enough water exists in the disk to fill thousands of Earth's oceans." None of this means that TW Hydrae will necessarily give rise to a garden spot like Earth. Water is a necessary ingredient for life as we know it, and comets are handy couriers, but a lot of other tumblers have to fall just right for biology to take hold. Still, if astronomical history  not to mention simple arithmetic  suggests one thing, it's that what happens in one spot in the cosmos has a pretty fair chance of being repeated at least a few times in the infinitely vast spaces beyond. The possibility that that kind of repetition includes life is beginning to seem more compelling than ever. Read about scientists finding a watery new planet. See iconic images of Earth from space.